It’s never too late. 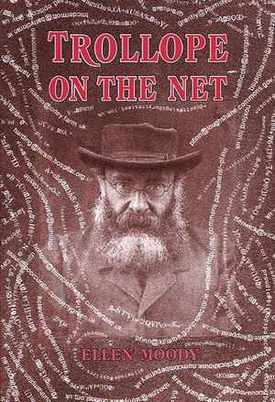 I’ve had a third official — published — review of my book, Trollope on the ‘Net, and I am so chuffed. Tyler Tichelaar alone took seriously and described “the other half” of my books, the part about my and other people’s experiences in cyberspace, mostly reading Trollope novels. That’s what’s revolutionary (as John Letts’s introduction says). I place as of equal interest and weight to that of scholars, the views of the other readers and myself on the list-serv the discussions occurred on between 1995-6 and 1997 (a majordomo list-serv managed by Elizabeth Thomson). and on the Amazon site where used copies are still for sale. I’m so pleased by what he says in an immediate way when he refers to how Trollope is still denigrated as simply writing for money, not out of an irresistible powerful creative imagination. Just the other day on the Trollope Society face-book someone quoted Jane Smiley who had trotted out that prejudice: his routine shows he was was somehow mechanical. No one who has read Trollope’s books with their mind alive and experienced his characters, stories, dramatic scenes, narrator’s presence, just spilling over and intertwined could think this. One of the members of the face-book group quoted one of Trollope’s powerful descriptions of his experience of his imagination. 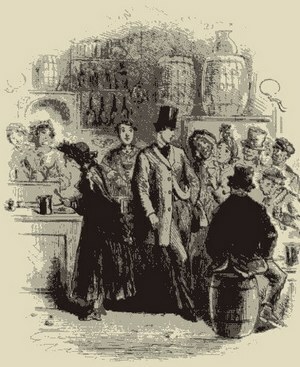 I did try to counter this in my book — I’ve a chapter on An Autobiography as a book which contains a remarkable percipient description by Trollope of his own reveries: he had a pictorial dramatic imagination and would see a character in a dramatic scene identified as say “the brother” or “the sister” and from that evolve a situation, and from that a story. I’m writing this blog partly to say I have about 3 boxes of the books left (maybe 36) from the original print-out beyond the ones sent to the members of the Trollope Society the year the book was published (2000). I’d be happy to send a copy to anyone for the literal cost of the book and postage ($15). My email: ellen.moody@gmail.com. Honestly it’s not for the money but because I’d like to make more people aware it’s about the Internet and takes an unorthodox view because of its dual context. As Tichelaar says, this is not to say it’s not scholarly. The two official reviews — published — I had thus far paid tribute to that part of the book. In one of the yearly round-ups of Trollope studies, Mark Turner devoted two gracious paragraphs to it, like Tichelaar commending my chapter on Trollope’s illustrations of which I am (I admit) particularly proud since I did most of my original research there — including wonderful days spent at the Library of Congress examining over 460 illustrations. 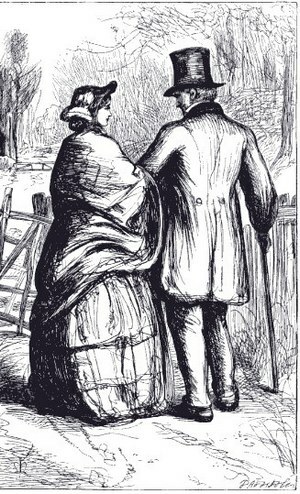 Many of Trollope’s novels were published in instalments and it was these that got the illustrations. They were a way of selling the numbers. Customers were attracted by putting some of the full-page pictures in shop windows. I am hoping to give a paper on these illustrations at a coming Sharp-l conference (fingers crossed). But he felt that the “other half” of my book got in the way, took up too much space. I’ve since been told by other scholars my opening chapter would traditionally place my outlook in the context of other scholars instead of placing it in the context of how I came to get on the Internet and lead reading groups. I held scholarly contexts off to every other chapter when after whatever book we read is covered, I put that book in its Trollope context (as Trollope’s Irish novels, or as Tichelaar, says his novellas, books under 300 pages of which Trollope was very proud). Margaret Drabble (astonishingly) read my book — she was a friend of Letts, and came to Trollope meetings, and she paid tribute to the readings of the novels. But she was amused at the Internet groups and thought reading on the Net might be like adult education. It’s not. I call these official because they are not my only reviews. Since my book was published I’ve had letters and notes from all sort of people on the Net saying mostly kind things about my book. Occasionally someone has put a review of it on a list-serv. Like Jane Austen (and probably others) I’ve saved each and every one and have a folder of them (not that slender). In physical space, who knows how many library and home reading groups there are. The two Trollope societies (really one, but located on either side of the Atlantic, NYC and London) have lectures: one is coming up in February in NYC which I am now hoping to attend: Nicholas Birne on Trollope’s La Vendee (a book we’ve read twice in our Yahoo group. As Tichelaar notes, and I say as the opening statement of my website where I have much on Trollope: “Anthony Trollope is one of the greatest nineteenth-century novelists with who (oddly) the majority of readers come into contact on their own.” And in spite of the “rise” of minor and women writers, and changes in the canon which have helped Trollope’s reputation there is still a stubborn tendency to omit Trollope from syllabi except for advancd English majors and graduate students. 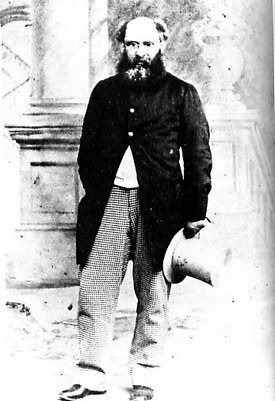 I put it down to his original reception in part: he was not seen as the towering figure Dickens and Thackeray were, and his refusal to allow himself to write his fiction to a particular agenda. He is willing to buck his readers. In Dr Wortle’s School, he tells his readers he has a couple living together outside marriage so it they don’t want to read about such a pair, then shut the book. Trollope loves to be self-reflexive and ironically half-break the spell of reverie and tell us much of what’s going to happen at the end. We should read his novels for how a thing happens, not what. I’ve grown to love the film adaptations of his novels, all of them that I’ve seen and written about them too. I find others love these films, especially the two mini-series, earlier (1974) Pallisers and (1982) Barchester Chronicles (alas only 2 of the six adapted). See He Knew He Was Right out of Moll Flanders. read him … and againe and againe: and then if you doe not like him, surely you are in some manfiest danger, not to understand him. And so we leave you to other of his Friends, whom if you need, can bee your guides: if you need them not, you can lead your selves, and others. And such Readers we wish him. I like to think my book is one place where you will gain such understanding. It’s intended for his real readers wherever they are.